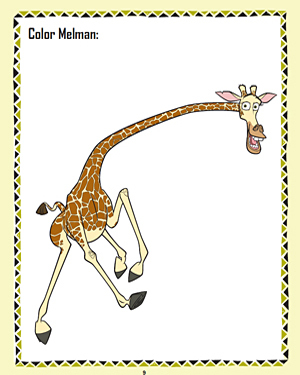 Here’s Melman, the skittish but loveable giraffe who truly is in love with Gloria, the hippo. But Melman doesn’t look his usual high-spirited self in this page. That’s because he is lacking in color. Go ahead and inject him with bright yellows and browns. This one is a lot of fun and your kids will just love it!